It’s so easy to make your own nut milk and you’ll also save a ton of cash doing it. Here’s my guide to making three of the tastiest and most versatile varieties: almond milk, cashew milk and coconut milk. Tip: Be on the look-out for wholesale shops, or buy bags of broken nuts – they’re usually much cheaper than whole nuts, and if you’re using them to make milk, flour or butter, it doesn’t matter if they’re all crushed up. So much cheaper than buying it ready-made, and you can store batches in the freezer. It has a deep nutty flavour. What to use it for: Use in tea or coffee; pour over cereal; use in baking or cooking; add to smoothies or raw desserts; use it to make dairy-free yoghurt, or simply enjoy on its own. How to store it: In sterilised containers in the fridge for 2 to 4 days, or completely cooled and then frozen in batches. Benefits of almond milk: Low in calories, loaded with vitamins such as A and D, rich in calcium and phosphorus, free of saturated fats and cholesterol and full of healthy fats. Reasons to make your own: Much cheaper than store-bought; fresher. (see my step-by-step guide with images here). Soak 2 cups of raw, blanched almonds in water overnight. Drain, rinse and add to a blender with 4 cups of water. Pulse a few times to break up the nuts, then blend on high speed for ten minutes. Optional: Add honey or maple syrup if you desire a sweeter milk. Don’t discard the almond pulp! Instead, spread it out on a baking tray and bake it at low temperature for about 3 hours, until dry. You now have almond meal to use in baking, smoothies or for a protein boost, or you can throw it into your food processor (when it’s cool) and process until you have almond flour. One of the creamiest of all the nut milks, and also one of the easiest to make because you don’t need to strain it. What to use it for: Thanks to its creamy flavour and refreshing taste, many people enjoy drinking it on its own. It can also be used in cereal, hot drinks and smoothies, or to make yoghurt or ice cream. See my coconut and cashew yoghurt recipe here. How to store it: In sterilised containers in the fridge for 2 or 3 days, or cooled completely and then frozen in batches. Benefits of cashew milk: You get a big nutrient bang for your buck – iron, phosphorus, magnesium, potassium and zinc – plus loads of protein and fibre. Reasons to make your own: Can be hard to find in the shops; much cheaper to make your own; always fresh. Soak one cup of raw, preferably organic cashews in water overnight. Strain, rinse and then place in a blender with 3 to 4 cups of water (depending on how creamy you want it). Pulse a few times to break up the nuts, and then blend on high for a few minutes. Give it a stir to make sure all the nuts have been broken down – if not, process for a few more minutes. Allow to stand for 15 minutes, then scoop the foamy layer off the top. Drink immediately, use in a recipe or store. Always purchase from a supplier where there is a high turnover to ensure freshness and quality. Look for plump cashews that are uniform in colour. Avoid the limp and shrivelled ones. Cashews should smell nutty and sweet. If they have a sharp or bitter smell they have gone rancid. To preserve the precious oils, store cashews in a sealed glass jar in the fridge for up to six months. Always soak cashews before using to remove the enzyme inhibitors and make them more digestible. 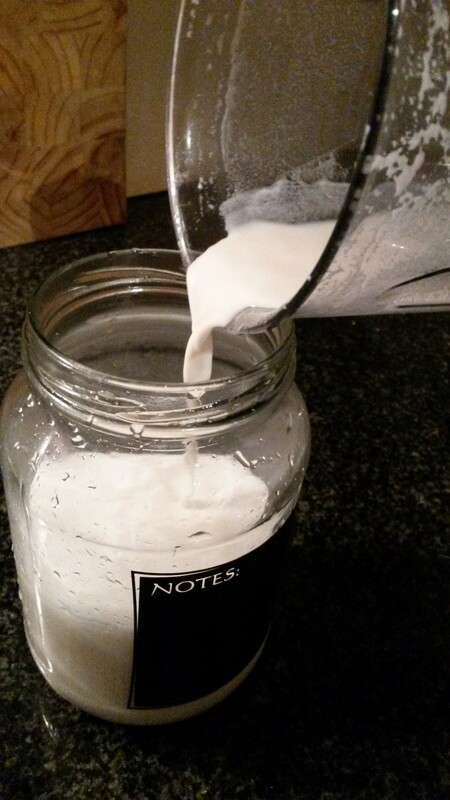 This is one of the cheapest nut milks to make and also extremely versatile. I love whipping up a fresh batch whenever I’m preparing the rest of my ingredients for a curry. What to use it for: In curries (especially Indian, Thai and Asian curries); in desserts – both raw and baked; in smoothies, soups and cocktails; over cereal, in stews and even in breakfast foods. Use it to add an exotic sweet tang to almost anything you like, or use it to make a delicious, dairy-free yoghurt (see recipe above). How to store it: Fresh coconut is best consumed right away or stored overnight in the fridge. Otherwise, as with other nut milks, allow to cool completely and then freeze in sterilised containers. If you are fortunate enough to have access to fresh coconuts, here’s a great step-by-step guide to making fresh coconut milk. Benefits of coconut milk: High in vitamins including vitamins C, E and B3, B5 and B6, and contains fibre, iron, magnesium, calcium and phosphorus. It should however be consumed in moderation, especially if you’re watching your waistline. Lower the KJ count by making it ‘lite’ – simply dilute it more. Reasons to make your own: Much cheaper than store-bought, always fresh, no dodgy additives, preservatives or other unhealthy ingredients; can be lower in kilojoules. Add 1 cup of fresh grated coconut or dry/dessicated coconut to a blender with 1.5 – 2 cups of warm (not boiling) water. The less water you use, the thicker and creamier it will be. Pulse a few times, then blend on high for about 5 minutes. 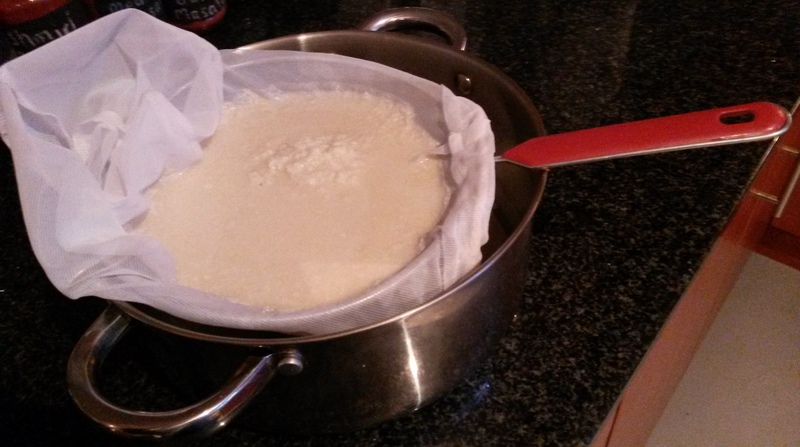 Pour the milk through a sieve lined with a nut milk bag and strain, squeezing out as much of the milk as you can. Discard the pulp.